No need to ever "eat the same thing twice" at this "first-rate" Eclectic buffet at the Wynn, where the "lavish spread" includes "every kind of food imaginable"
Indulge in a feast for all your senses amid the resplendent surroundings of the all-new buffet at Wynn, voted the "Best Buffet" in Las Vegas by the Southern Nevada Hotel Concierge Association. 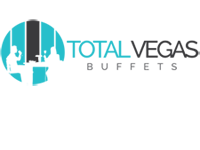 Sample tastes from around the world at the 15 live-action cooking stations presenting rotisserie grilled steakhouse cuts, coast-to-coast seafood and over 120 new dishes, all artfully presented. Newly reimagined décor and impeccable attention to detail imbue what is traditionally a casual dining experience with a fine dining sensibility. The finale is provided by the sweet patisserie, featuring warm pastries, chocolate fountain dipped specialties and an assortment of cakes and confections made daily by our dedicated pastry chefs. As USA Today notes in their review, "If there's one thing this town is good at, it's taking a great buffet and making it even better." for lunch from 11 a.m. to 3:30 p.m.
and dinner from 3:30 until 10 p.m.
Monday – Friday | 7:00 a.m. to 11:00 a.m.
Monday – Thursday | 4:00 p.m. to 10:00 p.m.
Saturday & Sunday | 7:00 a.m. to 4:00 p.m.
Friday - Sunday | 4:00 p.m. to 10:00 p.m.
Monday – Friday | 11:00 a.m. to 4:00 p.m. 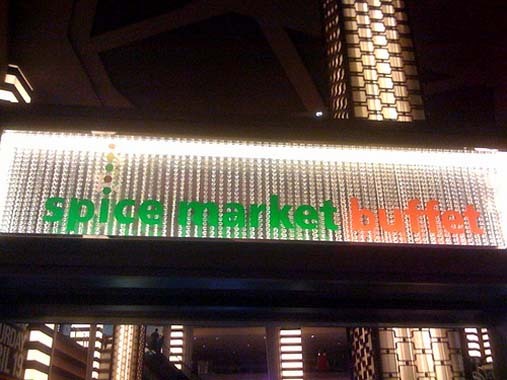 It's no wonder that Planet Hollywood's Spice Market Buffet has been voted best buffet in Las Vegas again and again. 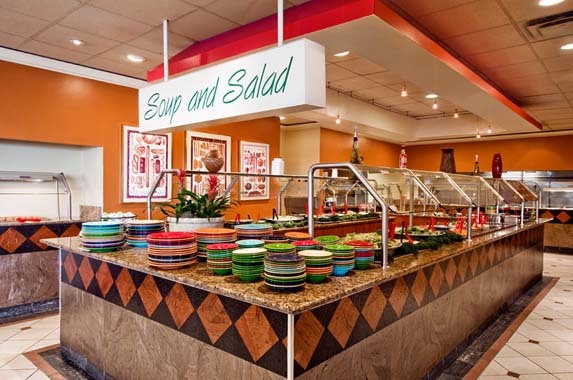 The buffet features fare from around the world. 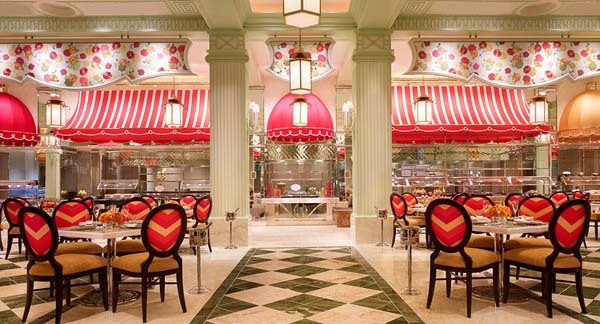 If you and your entourage can't decide on a cuisine, this Las Vegas buffet makes it easy. From Mexican and Italian to Asian and American, pile your plates high and go back for seconds possibly thirds. This Vegas buffet also features an extensive Middle Eastern/Mediterranean section. Vegetarians can enjoy hummus, grilled vegetables, two full salad bars and meat free pizza. Chefs bake all pizzas in stone fire oven. End with tantalizing desserts, like cotton candy, sugar free cakes and cookies. 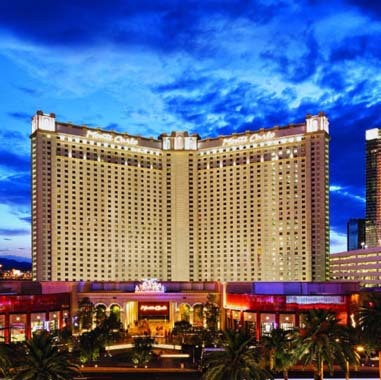 For Sunday brunch indulge in unlimited champagne and mimosas, which are perfect after a night of partying. The restaurant includes movie posters with food related titles. Keep your eyes peeled for fun ones like "Breakfast at Tiffany's," "Attack of the Killer Tomatoes" and more. 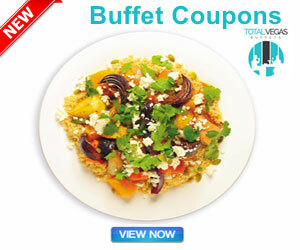 A departure from the traditional expectation, Las Vegas buffet dining is taken to a higher echelon here. Its incredible French village setting is highlighted by live action stations and food cooked to order. From the chef’s culinary expertise, Le Village Buffet brings to life five provinces of France for a dynamic, multi flavored meal. 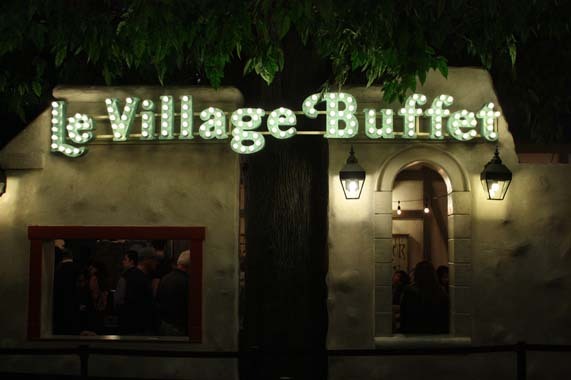 It’s also the only buffet in town to offer reservations on OpenTable, a plus when lines are stretching out the door. Traditional dishes from each province are featured at the buffet, including penne alla puttanesca from Provence. Homemade Yukon gold mashed potatoes and rotisserie chicken are inspired by Burgundy while a selection of signature savory crepes are a nod to Brittany. Dining for dinner? Don’t leave without sampling a few macaroons accompanying the buffet’s acclaimed vanilla bean crème brulee. Quaint, village like seating options allow guests to eat outside in the town square or near the fireplace in the casual dining room. Take in the sultry scenery, as each province's cottage room is decorated for the region. Additionally, an all you care to drink special includes draft Blue Moon or Miller Lite beer, house red and white wine or Bloody Marys for $12.99. From a quick bite to a decadent sit-down meal, The Buffet lets you do your own thing—morning, noon and night. Featuring made-to-order cuisine from all corners of the globe, you can choose whatever you like from our fresh, expansive salad bar, our fresh-made pasta bar, grill stations, a rotisserie, carving stations so that you can create the perfect plate. Naturally, you'll also want to sample at least a few of the irresistible desserts.